Having played four sold out nights at Wembley and headlined Glastonbury in the summer of 2016, Chris Martin and co will be back next June and July. Coldplay are set to perform in 13 stadium shows across nine countries as part of their epic A Head Full of Dreams tour. In association with Live Nation we were asked to come up with ideas for creative tour merchandise. …this is how frontman Chris Martin describes A Head Full of Dreams. 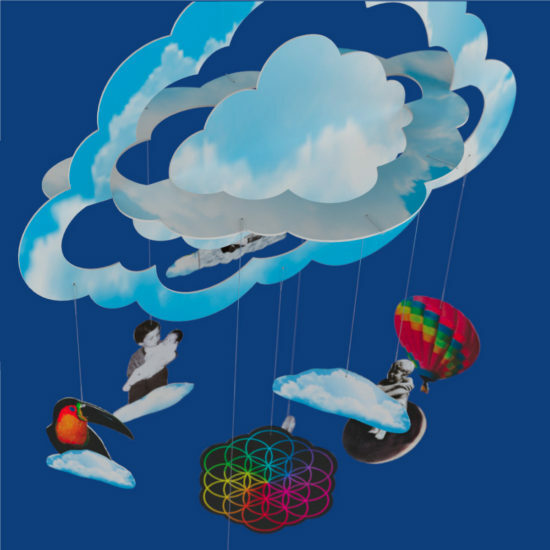 The album cover is a giant collage, a kaleidoscope of geometric patterns and dream-like images of members of Coldplay from when they were kids. We took these cues to come up with a range of ideas for tour merchandise inspired by a theme of colourful childhood memories. The band chose to go with a hanging mobile which captured the essence of the album. So we had the concept, but how to execute the product and then package it? We came up with a simple idea. It should look and feel like an old school vinyl album. The elements of the mobile were designed to pop out of two 12 inch “vinyl” discs for self assembly and would be packed into a double album sleeve, offering loads of image area for maximum colourful impact. Look closely and you will see the attention to detail. Each disc was packed in a paper inner sleeve with a centre hole, just like the real thing. The album cover was made by a specialist supplier of vinyl album covers. We even printed the recording grooves onto the surface of the discs to replicate a vinyl record. 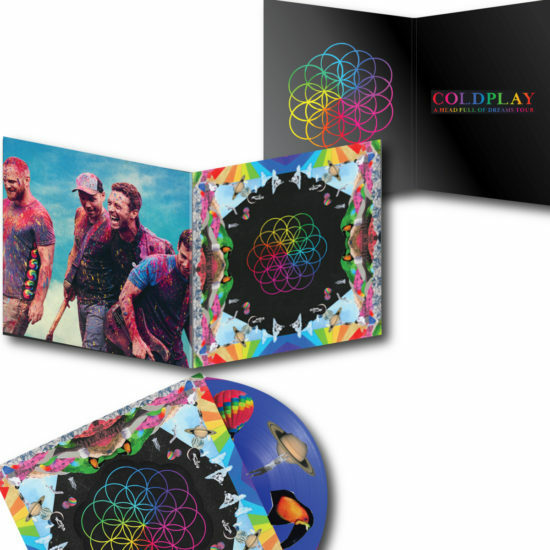 In all we delivered 15,000 mobiles for Coldplay’s tour, all printed and packed here in the UK… the band loved it. To compliment the mobile, we designed and manufactured a tour keyring. 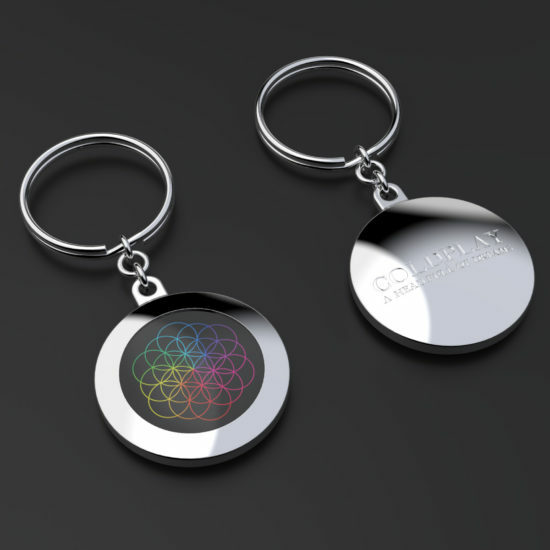 The design featured a die cast metal body with a soft enamel insert decorated with the very colourful “Flower of Life” motif that became the symbol of the tour. Tour merchandise is a market sector we love to work in; whether the client is a rock legend or one of the worlds biggest stadium bands, we totally get the challenge. We hope to be developing ideas for Coldplay in 2017.